Benihana on the King's Road is a Japanese teppanyaki restaurant where dishes are cooked in front of you on a teppan grill. 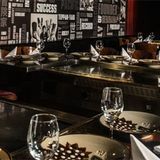 Benihana Chelsea is ideal for birthdays and celebrations with a private chef at every table, dazzling guests with their showmanship and culinary skills. By sending this booking your details will only be sent to Benihana and will never be shared with other third parties. By clicking this box you agree to the Terms and Conditions set out above. You can book to reserve an area of Benihana for you and your friends. Just enter your requirements below to see what they have to offer. What did you think of Benihana? Excellent place!! They have Japanese Wagyu Beef menus. Lunch time it's reasonable £29 that I may have to pay more than double at other restaurant. I think dinner time is much better atmosphere and in a group should make it better. I was totally blown away by my experience at Benihana! I was visiting friends in Kensington and they suggested we visit Benihana as it was one of their favourite restaurants. We were not prepared for the spectacle that was awaiting us! Amazing talented chefs/performer was there to take care of us but most importantly, the food was absolutely delicious. Our favourites were the prawn and beef dishes. The performance element really adds to the experience and we came away throughly satisfied! We travel a lot and if we are close to a Benihana if will be making a beeline for the front door! Benihana was almost empty when we visited last month on a Thursday night- now I know why. I went to this kings road Benihana twice before and every time I leave the restaurant, I need to take all my clothes to the dry cleaner- they smell so bad. The service is so average- from the girl who took my jacket who told me "tips for the clockroom are not compulsory but appreciated"- what?! Which establishment would have staff making such a forceful comment to a customer who simply asks if the cloackroom is free of charge- it's a restaurant, not a west end club! The food is already pricey, why would I have to pay for a cloakroom? Thank god you don't actually charge for it. Shame on you for having staff who hint so heavily about the pound that they do expect from you. Now the "show"- overrated, overdone. When you've seen it once, you find it boring, repetitive and err. Just not funny! Yes the little prawn is crawling on the stove. Ha ha, hillarious. Not. The food got cold in no time because Mr Busy Chef who was bored senseless of doing the "show" over and over again that he rushed all the cooking, throwing food on our plate in a random order. So much food at the same time, it was bound to get cold! The only pleasant thing about the evening was the other customers at the table- friendly and who agreed with us about the whole experience:poor, poor, just poor! The chefs are bored- when they're not doing the show they seem to dislike so much, then they stand against the wall, in a very casual manner and stare at the parties, occasionally making comments in non English language ( chinese/thai maybe?) about customers- this is so obvious to spot. I am not surprised Benihana was almost empty on a normally busy evening- people just won't return ever again, just like our group. Who will cook your dinner and give your “show” at Benihana? It is totally random. NO SHOW WHATSOEVER. Not a single flame of fire, not a single humourous interchange with the customers, not a single display of rhythmic chopping or even a juggle of the salt shaker. The chef that it was enough to cook the food like a short-order grill cook in an American diner. The timing of the meal was completely off - he served the main course for my husband before the appetiser was even ready. For the rest of us, he plunked down the main courses and appetisers of the other people ALL AT THE SAME TIME on their plates. RUDE: When I requested he slow down a little bit, he exclaimed indignantly with impatience: "But I have other tables to serve". TOTAL LACK OF SEASONING: our chef did not know to put the teriyaki sauce or other seasoning on the food while it was still on the grill. We received lumps of overdone, unseasoned food on our plates; he splashed some teriyaki sauce as an afterthought! Everything was OVERDONE (seared, sushi grade tuna ordered rare only takes a few seconds to cook, not 5 minutes on a tepanyaki grill!). Did not respect the MENU: the companions at our table had ordered a wrapped steak dish (which the chef did not know how to "wrap" I suppose); he served huge slabs of steak uneatable with chopsticks! Forgot to serve items that were ordered, but which nevertheless appeared on the bill! (yep, we paid for that spinach as I realised once we were back at the hotel). Benihana’s is the most entertaining barbeque you’ll ever go to, but without the burnt sausages and the undercooked steaks. Benihana is described as America’s most popular restaurant and you can understand why with its huge hot plates and entertaining chefs. They also have the usual photographs in reception with celebs like Justin Timberlake and politicians like George W Bush. The venue is large so if you’ve got a big group of friends it makes for a really entertaining night out. Weekends at this Benihana location are always busy and there’s a mixed crowd of tourists and locals all sitting around the large tables made for 15. It’s a bit like a posh Wagamama with everyone sitting together, but the food is much classier. The chefs really do make it a great night and their tricks are impressive. They can flick prawns into people’s mouths, juggle pepper pots, set onions on fire and make them puff like a steam train. It’s all designed for the tourists and it must eventually get boring for the chefs, but it works. 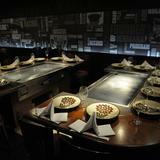 Benihana restaurants are traditional Japanese-style hibachi steakhouses called teppanyaki. You can choose a range of menus for around just under £50.00 which gives you scallops, prawns, steak, and some great tuna. The menu also provides sushi, soup, and a dessert. 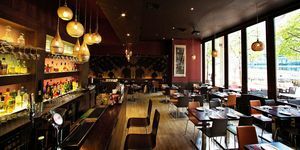 The food is very good quality and it’s worth the money but don’t get caught out by the constant pouring of drinks that goes on during the meal. You’ll find your bill going through the roof. The drinks are pricey so if you’re going to have wine and you’ve got a tight budget make sure that you take your time. The cocktail list is impressive and the Sake martini is a speciality. There’s also a good selection of Japanese and European beers and lagers to choose from. If you want entertainment and a good meal then go to Benihana. Remember though, the King’s Road location and the expensive drinks ensure that it’s not going to be a cheap night. The show is great at Benihana, the food, not quite! I'm a regular diner here just because my partner loves their sushi, but that's about it, I guess. The food at Benihana is all quite pricey, especially if you pay the normal price on the menu and the food is mostly bland! Nothing exceptional. Benihana is all just for show. On the other hand, they do regular promotions which is good for people who are first timers but if you go to Benihana all the time, it gets so boring. Do not under any circumstances be fooled by the offer of an alternative night out at Benihana. This place is a complete rip off! The night at Benihana began with us being told to wait in the holding pen whilst our group of ten arrived. The cocktails we ordered were incorrect which was not the best start. Eventually we were taken to our private room. The Chablis we ordered was mediocre and warm, the bottle was left in the ice bucket and we were left without a drink or an apology for over 25 minutes. Our food was like the wine - uninspiring, drab and disappointing. After only an hour and a half, we were asked to leave the dining area and take our dessert to the holding pen. Apparently Denis Wise wanted our table - he was welcome to it! We paid £60.00 a head at Benihana and got nothing but terrible service and bland food which combined to leave a bad taste in my mouth. Try McDonalds on the King's Road - it's cheaper and quicker! Avoid Benihana! Our kids love Benihana. They're not usually into foreign foods but the staff are so into the food at this restaurant that they happily chomped away at all sorts, they were so entertained. Now they're always asking to come back to Benihana, which is good, 'cos we love the food here too. AVOID like the plague! Pompous, rude and overpriced. Overall: Horrible service. For the price (£45pax) I'd rather Nobu! Service: Absolutely trash. We were a party of 16, 12 of us arrived early and had been waiting at the cocktail area. They refused to seat us till everyone arrived, yet proceeded to complain that we were late. When I asked for my coat to be hung up, the woman lied and claimed that the cloakroom was full. We found out it was a lie when the late ones arrived and got their coats put away at reception. I then complained to the manager about the lie, and he did not apologise, but instead remarked sarcastically, 'oh, but you were a 1/2 hour late'. When we were finally seated, they then ignored us for over 45mins before taking our orders. 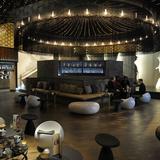 Atmosphere: What little atmosphere there was, was completely ruined by the attrocious service. Food/Value: So-so teppanyaki styled grill. The chefs were good performers, and rather enjoyable. Though the actual taste was just so-so. The menu claimed to be lobster and steak hibachi, but what we got were shrimps and pieces of beef! I ordered 'rare' for my beef hibachi but ended up getting more of a 'medium' hibachi. The portion sizes were quite small, and though I was comfortably full, my bf had to have a kebab after to fill him up. The sorbet (only 1 choice for dessert) was too sweet. 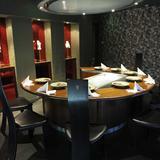 Top quality Japanese restaurant where the food is cooked right in front of you. On entering the venue you are shown to bar seats where you can have a few drinks until your table is ready. In the restaurant, all diners sit around a table which includes a cooking hot plate at its center, where your chef for the evening stands, poised to cook whatever you order in front of your eyes. Just don't leave the Saki on the hotplate for too long as I did - the drunker I got the longer I left it, which resulted in attempting to down boiling wine! In the end and enjoyable evening and well worth recommending to your users!